Zofin Garden is a restaurant in the famous Zofin Palace (Zofinsky Palac) on Slavonic (Slovansky) Island, smack in the centre of Prague by the river. The Palace and the Restaurant are run by a sophisticated Gastro Group called Zatisi Group who have been on the market for quite some time. Zofin Garden is a family oriented restaurant with an Indoor Play area for kids (only in the warmer months in the marquee outside) and Sunday family brunches with a Children’s Entertainer. We have been to the outdoor garden brunch featuring a trampoline and slide before, but we’ve never been to the winter Brunch. Here is how it went. Not to confuse anybody but in the warmer months Zofin Garden operates mainly in the marquee outside. Here you have the play area for kids and a beautiful view of the river. When its cold, really cold - they cannot heat up the tent enough and they host you inside the Palace - in the restaurant itself. Here they don’t normally have play area and but they do have the Children’s Entertainer for their Sunday Family brunches. We visited right before Christmas. Zofin Palace has a rich history and a beautiful Ballroom. Coming here for a ball you feel almost like you are in a Cinderella tale. The palace is separated on the Island and is lit up at night. Red carpets going up the big staircase sure make you feel important before entering the palace halls! I have been here for several Dancing-Balls and loved it. 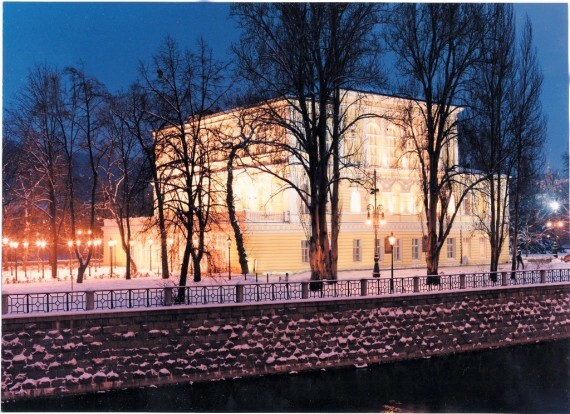 In recent years the Žofín Palace venue has become the place for Czech and international social, political, cultural and business events of exceptional importance. The price is: 695czk per Adult and includes a Bohemia Sparkling wine welcome drink, the unlimited buffet menu and unlimited consumption of soft drinks, coffee and tea as well as unlimited consumption of beer and house wine. Kids aged 6 to 12 years are 295czk and kids under 5 eat for free. 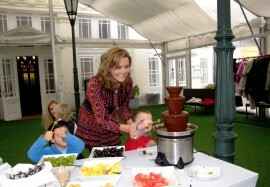 The real attraction for kids is the Chocolate Fountain. Apart from the animation this is what my kids always remember from here. Zofin Garden hire 2 entertainment agencies for their brunches. At least 3-4 people look after your children keeping them busy and happy, playing games, participating in craft projects or simply watching over them. This gives you full freedom to enjoy your Sunday morning without stress. The agency we experienced this time was called RTC Agency and it is a popular Agency hired for birthday or company parties. Always one of them speaks English and all of them are young and motivated people. More about the RTC agency down below. The same day we came here a girlfriend of mine, Irina, went for brunch at Hergetova Cihelna. They payed more and the children were bored. I am not criticising the Hergetova CIhelna brunch but I have heard several times that’s it’s a family brunch yet the kids don’t have that much to do there. Here they are constantly occupied and entertained. This is not the first time I’ve come across RTC Production agency. I have heard from other people that they provide very good services for organising any kind of party or presentation, including decorations and kid’s program. Their first events were focused on Kids and remain, however since 2006 they’ve expanded into Sales Promotion events, Road shows and Events for shopping malls such as Halloween and St. Nicolas etc. A good TIP if you work in Marketing. They are based in the Galerie Nove Butovice shopping mall and they organise all events for this Mall as well. Here they run a Family afternoon with games and entertainment for kids - for FREE every Sunday. Their biggest event for kids which is known all over the Prague is: The Fairy Tale Forest (Pohadkovy Les). We attended in 2012 and it is massive. It’s a whole day program with bouncy castles, activities, sponsor tents that continues all the way to the Prokopske Udoli park. There are around 12 stations with Fairy Tale creatures (people in masks) where Kids fulfill exiting tasks and collect stamps to receive an award. Since this is an article about Zofin Garden I will write up a separate article on this subject with all the details and information closer to the event.